Comes with FULL Master Resell Rights, and 2 Mystery BONUSES! Now You Can Drive Insane Traffic To Your Web Site Using The Magic of Article Submission...and it all happens practically on autopilot! * Use My Article Submitter and your articles to establish yourself as an expert in your particular area. * Use My Article Submitter and your articles to make more sales. 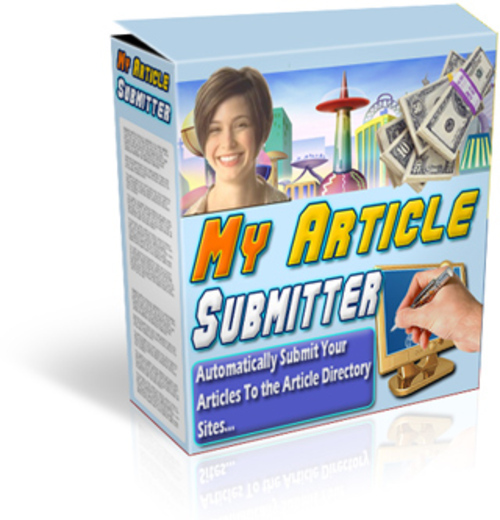 * Use My Article Submitter and your articles to generate more traffic. * Use My Article Submitter and your articles to increase your Google Page Rank. * Use My Article Submitter and your articles to boost your Alexa rating. If you have always wanted to be able to quit your day job and break into the Internet Marketing world My Article Submitter is a great way to do it! Grab this incredible software now! We have 163 Directory sites already loaded in but you are welcome to load in as many more as you wish, also do not be fooled by other Article Submitting Software that claims to have more than 500 sites to list your articles to! These are SPAM MACHINES that will have you looking like a fool in no time flat! They will have you submitting articles where they are not wanted and many of them even post a link back to their software right in your articles that you submit. Nowhere, in any article you submit, will you ever see any mention of us or our software, not to mention the Article Directory owners will not have any idea you used a submission tool, your articles will look totally hand submitted. My Article Submitter does not just allow you to load in 500 articles and hit a button a forget it. Any software that promises this is doing nothing more than spamming your articles all over the Net. This product comes with MASTER RESELL RIGHTS! To make the deal even sweeter for you, we are even including two unannounced bonuses with it! Only those who purchase this product from us would be able to get the bonuses at NO cost!